If you go to the Your Albums section of your photos page on Google+, you can configure the privacy settings for your photo albums. Narrowing who can see your photos to select circles is a way to ensure that pictures of your kids are being shared only with the people you want to see them. Or maybe your employer doesn’t need to see your party pics. You can target those party pics here as well, by selecting a circle that doesn’t include your employer, for example. Next to Visible to, click Edit. You’ll see what circles your album is visible to there — it will likely say Everyone or Limited. In the pop-up box that appears, type individual people and circles you want that album to be visible to. If you want everyone to see it, choose Public. If you also want to target another circle, choose that as well (see the following figure). The point is you can choose whatever circles you want to see that photo. Your album will now be visible only to those you specified. 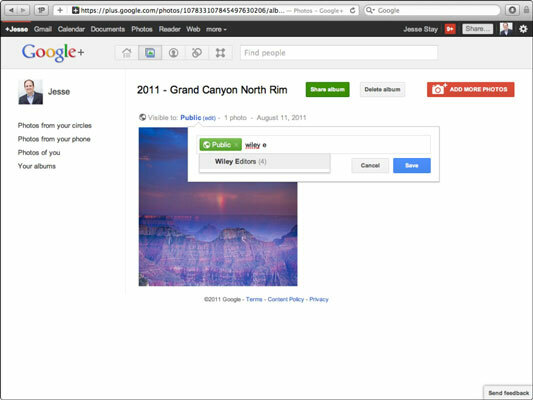 Setting privacy settings for your albums in Google+.